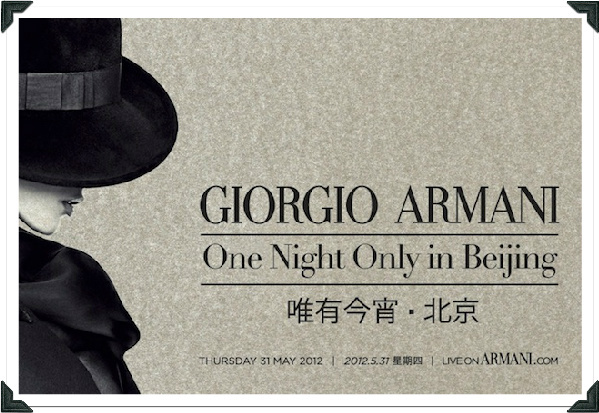 Back at the end of May, Giorgio Armani took the Chinese fashion market by storm by hosting a HUGE fashion event where he showcased the Fall 2012 RTW collections from his labels Emporio Armani and Giorgio Armani as well as his Spring 2012 Armani Prive Couture collection. While there was nothing new that was shown in the collections from Emporio and Giorgio, Mr. Armani showed brand new couture ensembles alongside creations that walked the Prive runway back in January at his Paris fashion show. When I first saw the images of the new Spring 2012 Couture collection gowns I was dumbfounded as these gowns are what I would have actually liked to have seen walk the runway. These are the gowns that get hidden in the backroom of the Armani Atelier and saved away for celebrates to wear to for Awards Shows and Film Festivals. Bellow are just a few of my new favorites from what was added to the collection in Beijing. This is the first look that I fell in love with. When I first saw this gown I knew that I have to see this on the red carpet. I thought of Amanda Seyfried wearing this gown to the Tony Awards which just past on Sunday night. I wish that she had chosen this gown over the Givenchy Fall 2012 RTW collection that she actually ended up choosing. I think that this would look amazing on her. Fan Bingbing was one of the Asian celebs that attended the Armani ‘One Night Only in Beijing’ event on May 31st and I am hoping that she immediately went backstage to see Mr Armani and requested this amazing green chiffon ballgown. I think that this is a classically beautiful silhouette that Fan tends to love mixed with an edge that is brought about through the color. As soon as I saw this gown Jessica Alba came to mind and I am just sending prayers to the gods of fashion that her stylist, Brad Goreski, will pull this gown for one of the red carpet events that Jessica attends. I think that this gown with a white strapless top that goes into a beaded drop waist with a green skirt with a black sheer overlay is something that Jess would totally die over and would rock for any formal appearance. Milla Jovovich looks amazing when she hits the red carpet be it in something edgy or something classic old hollywood. This Armani Prive gown is definitely something edgy and I think that she would look absolutely stunning in it as she is one of the few celebrities who has the right attitude to pull this gown off. Zoe Saldana has a promo tour coming up for the ‘The Words’ which I am hoping will debut during the Fall 2012 Film Festival season. I am praying for this so that Zoe can wear this stunning gown with a voluminous skirt for a premiere. Here you can watch the full show!